On Wednesday Aneela Hoey posted on instagram that she was going in to surgery for breast cancer. She hadn't been on social media for a while and this was the heartbreaking answer to why she wasn't around much. I feel like the fabric designers we love give so much to the quilting community, why not take the time to give a little back to Aneela and her family now. And so, the #quiltforaneela. 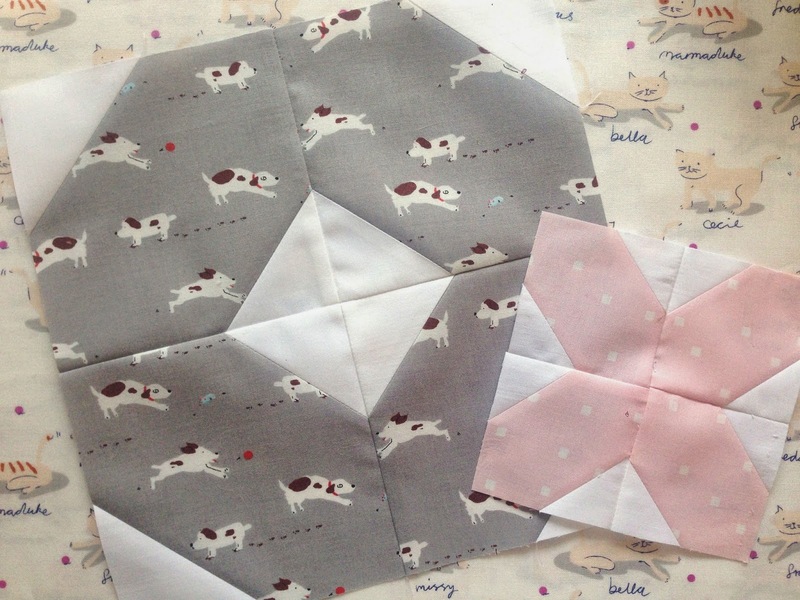 My idea was to make Aneela a quilt using this brilliant tutorial from Megan at Canoe Ridge Creations. It's free and fast, perfect, right? If you'd like to make an x or an o or both, that would be awesome. Two things, though. Please make the body of the x or o in Aneela's fabric (all one print or scrappy). And please make the background white (no specific white, some of my blocks are kona snow, some Michael Miller white). 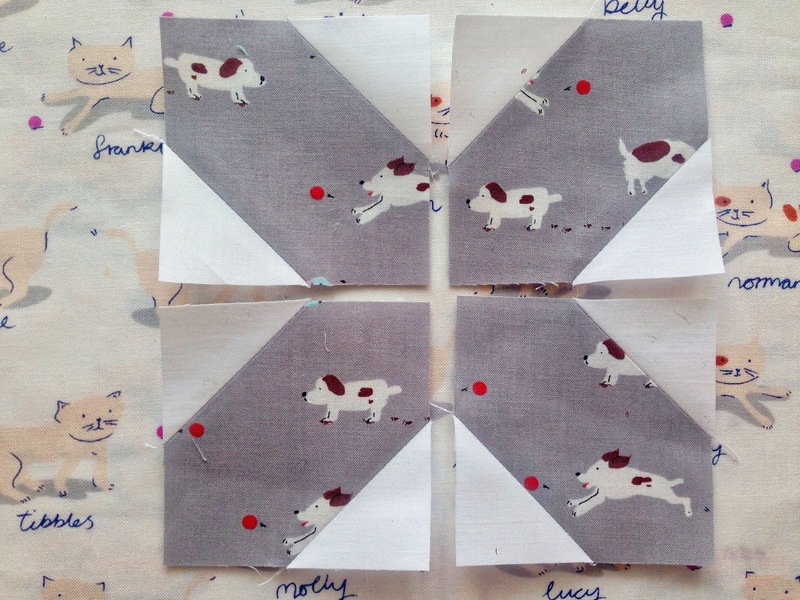 If you'd like to join in but don't have enough fabric for the four 5" squares called for in the original block pattern (my Aneela Hoey fabric normally gets used up right away! ), I've come up with an idea. Mini blocks! 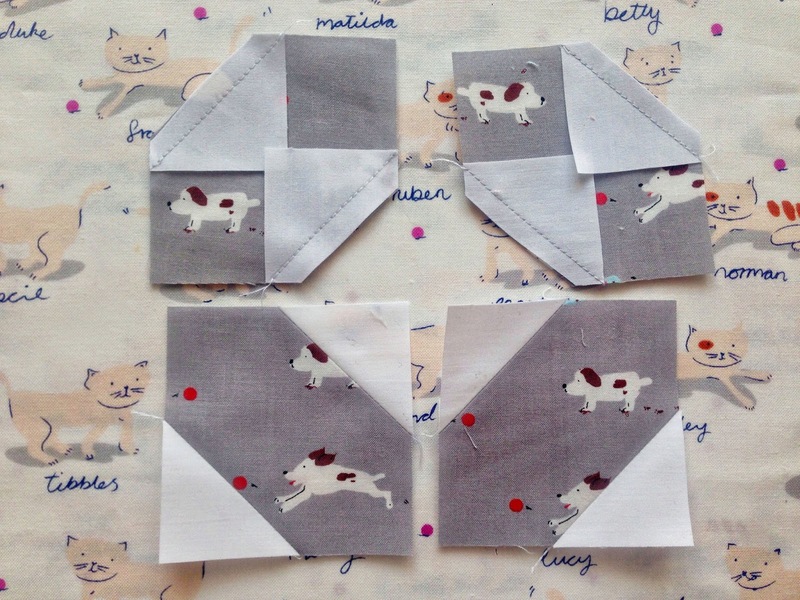 These half size blocks finish up at 4½" (5" with seam allowances) and are super cute. 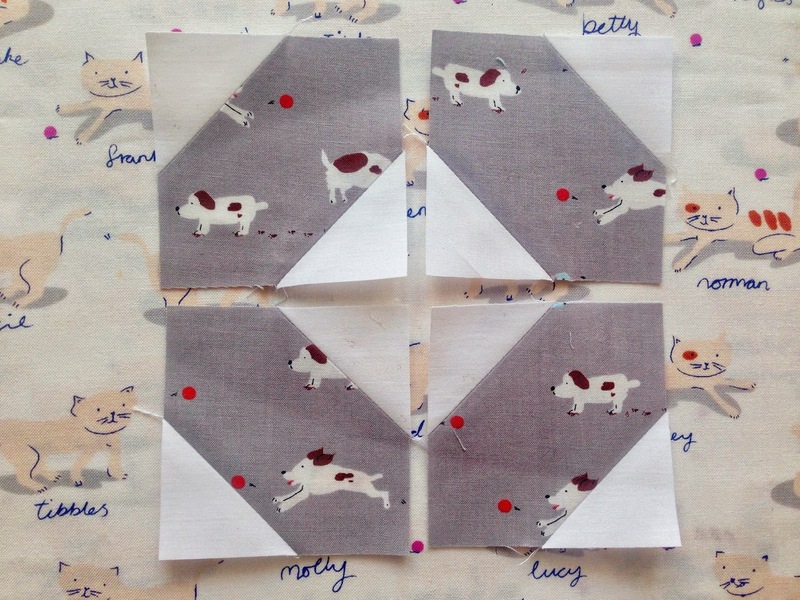 4 squares of Aneela's prints cut at 2 3/4" x 2 3/4"
8 squares of white fabric cut at 1½" x 1½"
Draw a diagonal line connecting two corners on each of the white squares. 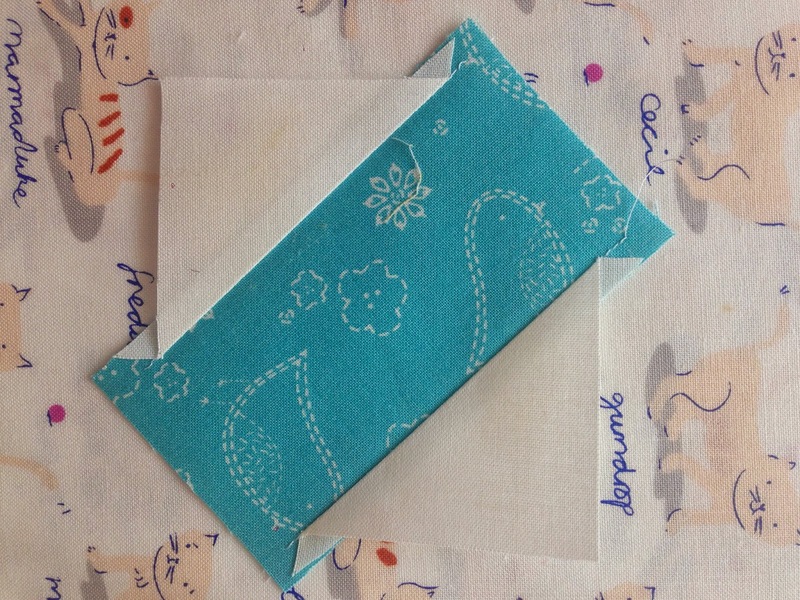 Sew two white squares onto each print square along the marked line. Trim off the extra fabric then press the the triangles out. Or an O! And stitch the sub units together with a ¼" seam allowance. 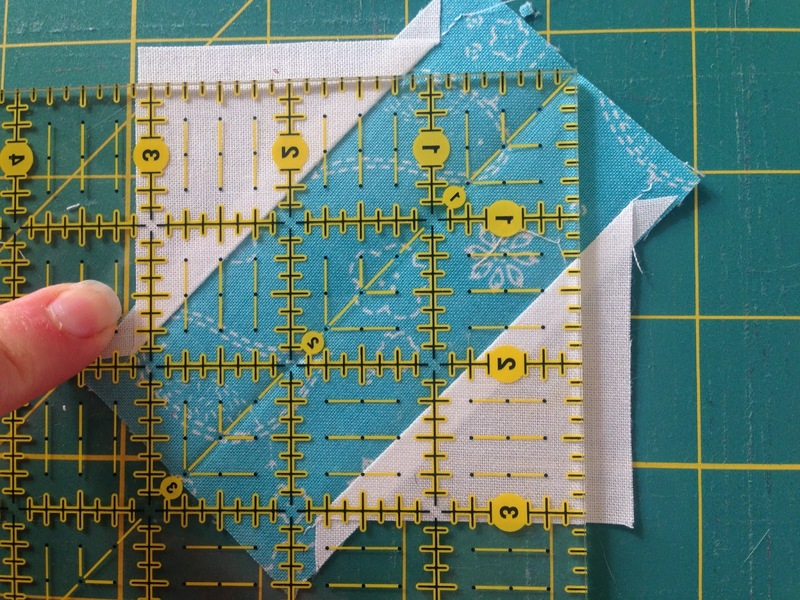 Now, what if your pieces are even smaller, or you're working with jellyroll strips? Don't worry, there is a solution! For this method I just took photos of the sub units, so you'll need to multiply everything by 4. For one sub unit you'll need a rectangle of print 2¼" x 4" and one square 2½"x 2½". Cut the square in half on the diagonal. 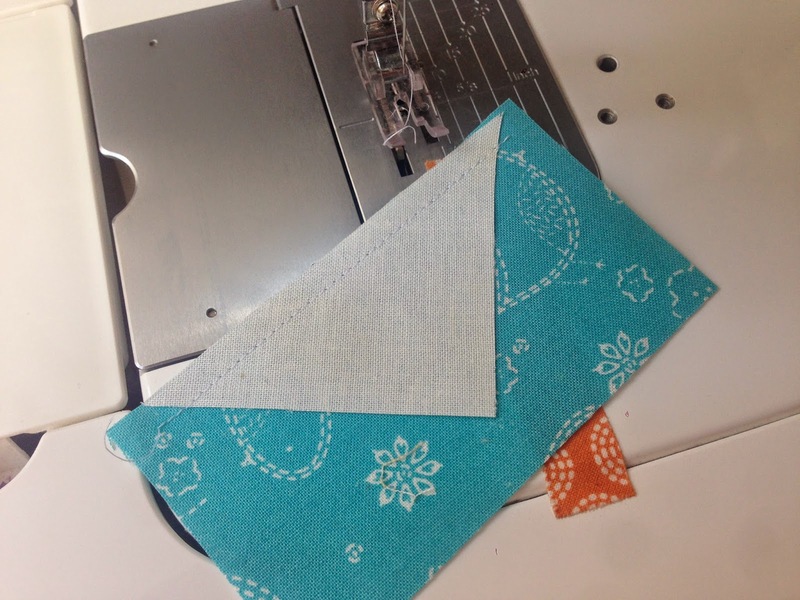 Centre the triangles on the print strip and stitch down using a ¼" seam allowance. 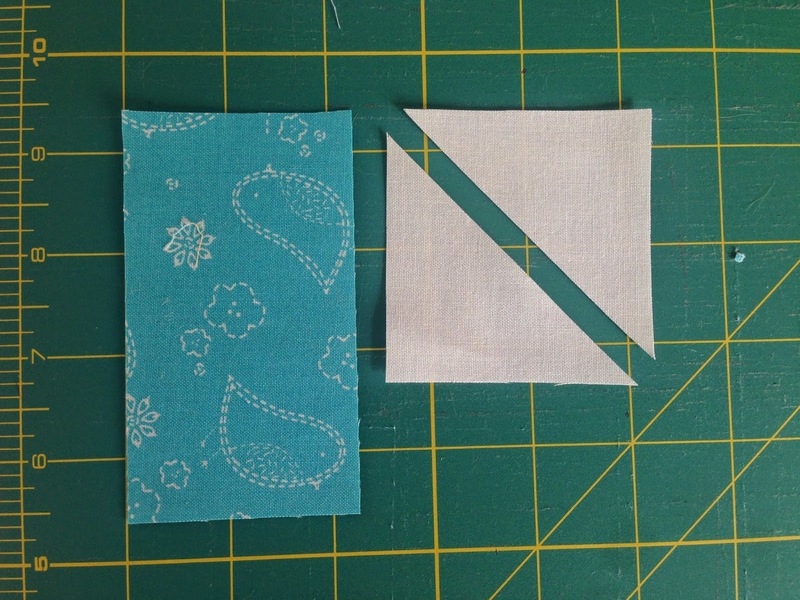 Now fold the blue rectangle in half along its length, finger pressing to get a crease. Use the creased centre line as a guide to trim the sub unit down along 2 sides. 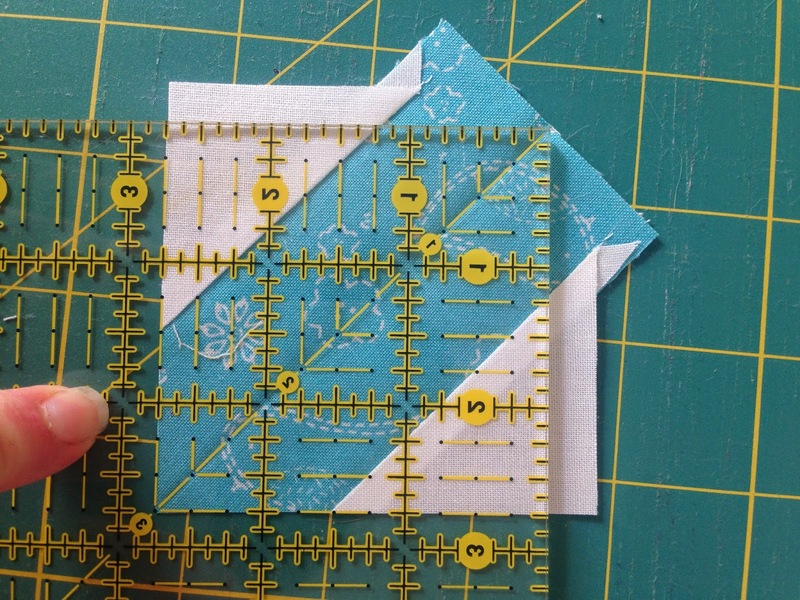 If you have a square ruler it should have a diagonal line that you can run along the pressed line. We'll be trimming these units to 2 3/4" so make sure you don't cut off too much! Flip your piece around and trim the other 2 sides to get a nice 2 3/4" x 2 3/4" square. Now make another 3 and decide if you want an x or o. Thank you so much to anyone who wants to send blocks!!! My goal with this is to have a quilt to Aneela as soon as possible, so I'm hoping blocks can be on their way to me by July 1st. I'm not sure what the response will be like, you never know how big things can get when we all rally! So my plan is to make up to a 90" x 90" (100 original size blocks or 400 minis, or a mix) for Aneela. If I get less blocks, the quilt will be smaller. If I get more I will use the blocks to make quilts for our local oncology patients. I'll update as blocks arrive! Speaking of arriving... once you have blocks ready to send, leave a comment here or contact me on instagram (chelseafr) and I'll send you my address. I'll make my blocks tonight and have them ready to mail in the morning. You can send me your address at jfroot@comcast.net. This is such a wonderful thing to do! 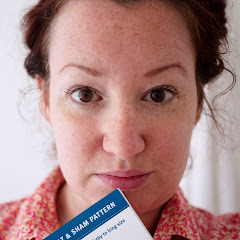 I love Aneela's fabrics and book. So sorry to hear this. I will see what I have on hand. Great project idea, can I repost or link back to spread the word? Posted a quick one on my blog with link back to you for all directions. Now, off to get my blocks started. I will have them posted on Monday. I will make a block or two and send them out asap. You can email me at amybfriend at gmail dot com. Going out if town this weekend but I'll make my blocks on Monday and mail them Tuesday. I would love to contribute. I have quite a stash of her fabric so I can make big or small blocks! Will be making blocks this weekend. I am mascanlin49 at hotmail. Thanks for pulling this together. 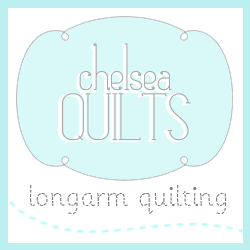 Hi Chelsea, I was thrilled to see you'd blogged today and then my heart sank as I read your post. I'll get cracking with mine and send a bit of love from Australia. Well done, a lovely, thoughtful gift. I'd really like to contribute. Will make up some blocks this weekend. I've just finished a block and will send it as soon as I get your address. 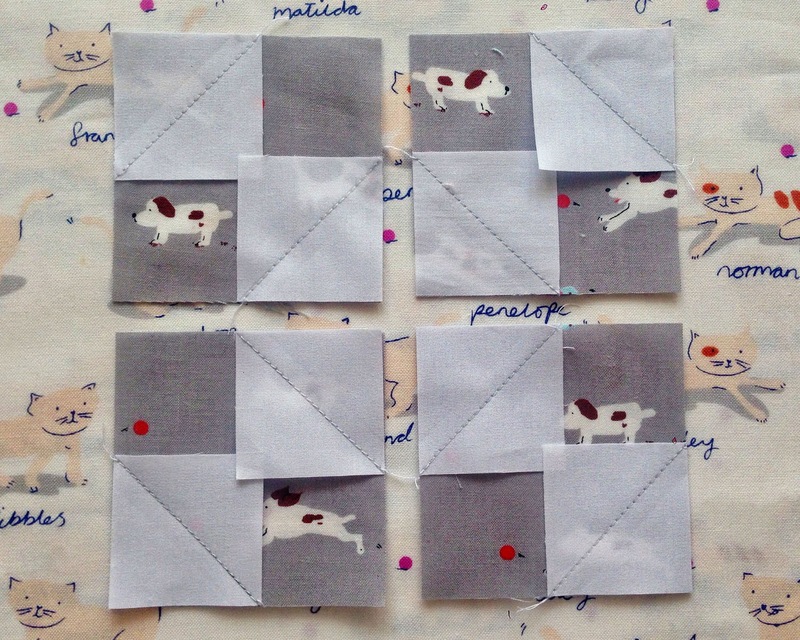 I'll make some this weekend so I can post on Monday - sweet mini blocks ! daisyandjack@hotmail.com ! Got two blocks done this morning. Let me know where to send them ! I have a couple of blocks ready to send. Thank you for putting this all together. I love being a part of such a giving community. I'm making two blocks this weekend and send them in an express shipping that delays 7 to 10 days to arrive, hope it arrives until 1st July! And I will put a lot of love and good thoughts to help Aneela! Thank you for this datling idea and for letting us participate of it! Thanks so much Silvana! I don't have your email address so if you can send me an email at annietwinkletoes@gmail.com I'll send you my address. Please send me your address! So heartbreaking! I made a couple blocks! Wishing Aneela complete recovery and much support along the way. Wondering if you are in the U.S. or U.K.? I'm actually in Canada! If you'd like to make a block let me know and I'll get back to you with my address. I'll try to make a couple of blocks for you tomorrow. I hope Aneela pulls through with flying colors! Thanks so much for doing this! I'm in Brazil right now... so mailing should take a while... by the end of the month I will be in Dallas for a weekend so I guess I will post from there. Will it work? Thanks for organizing this... my mom had breast cancer too, so I know how important these simple gestures means. God Bless you and I'm sending all my best wishes to Aneela and her family! Hi Renata, thanks for joining in! I hope your mum is doing ok. Send me an email at annietwinkletoes@gmail.com and I can give you my mailing address. Hugs. Hi Chelsea. I have my blocks ready to send to you. They're at the top of my latest blog post if you want to see them. Let me know where to send them. Thank you again for organizing this. Hi is it too late to make an x and I block and send it to you? My email is heather.hanak@gmail.com. Thanks. I can make one or two this weekend and send to you Monday. Can you email me where to ship please? StaciLF at gmail dot com. This is such a great idea I love Aneela and just found out about this its so sad. Thank you for your effort to gather people and show love to our beloved friend, Aneela..
i made two little blocks and would love to send them to you. Hi Nadra! Thanks so much for making some blocks! I don't have an email address for you, so could you email me at annietwinkletoes@gmail.com and I'll get back to you with my addy.. Thanks! Will you send me your address? We ( a mother /daughter team) made two little blocks for Aneela's quilt. Will you please send us your address? The blocks ship from Europe(Germany!) and may travel for a little while. Thanks for organising and sewing the quilt. Hi, Chelsea. Thank you so much for organizing this! I have two blocks to send to you--posted a pic on IG. My email is mbutler3@kc.rr dot com for your mailing address, at your convenience...thanks again! What a sweet thing to do :) I posted on IG earlier today that I would love to help out. Please send me your address at lnielsen64 at gmail dot com Thank you! Please, count me in! Where do I send them to? I'll do this tonight, please send me your address- email address is on my profile :) Such a lovely idea. I would love to contribute! Send me your address if you still need blocks. I have 2 blocks ready for you. Please send me your address. I have a couple blocks ready to send to you. I'll send them as soon as I get your address! I just saw this on IG tonite. 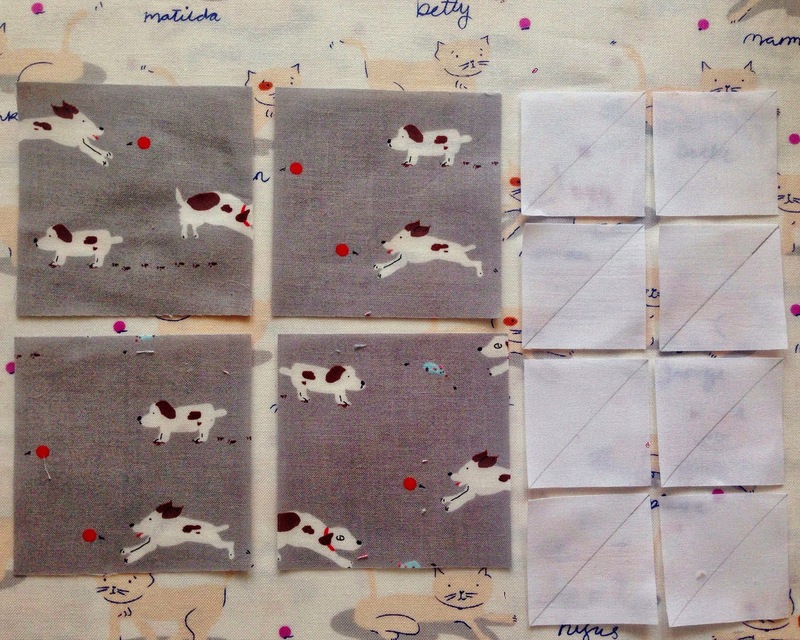 As soon as my little fabric order arrives I can whip them up hopefully by the middle of next week! I have some blocks to send from Oz, my email is rebeccabarrett35@gmail.com. Thanks so much for doing this, she was in my thoughts the whole time I was sewing them! I made a mini block for Aneela- please send me your address to dandtbarrett@dejazzd.com. Thanks for doing this. I just saw this today. I'd love to send several blocks. Please tell me where to send them to. I think some of us are going to send them in bulk through MODA. Has Lissa talked to you about this? HI Joanna. Yes she has! That's so great that everyone at Moda is helping out so much with this. Much love to you all! I've made two blocks. :) Could you send me your mailing address please. Hello, I will be able to send my blocks by Monday. Could I have your address please? lisawalsh at frontier net dot net. Thanks! Hi! Thanks for putting this together! I made two blocks this morning, let me know where to send them! What a lovely idea. I have made 2 blocks. Please let me know where to send them and I'll put them in the mail on Monday. mssooner at hotmail dot com. Thanks so much for putting this together! I have four blocks ready to go. My email is charlottesgraceforacure at gmail dot com. Hi, what a fantastic idea. I have two blocks ready. Please let me know where to send them. I have a block ready to mail. Please send me the address! Thanks so much for doing this!!!! My blocks are ready to go, please send the address. Please send me your address. I love Aneela's prints and would love to send you my blocks. Are we supposed to sign the blocks?? Hi Nancy! You're showing up as no reply so could you email me using the mail icon at the top of the page? Thanks! And no to signing the blocks, but you're welcome to include a card for Aneela if you'd like. 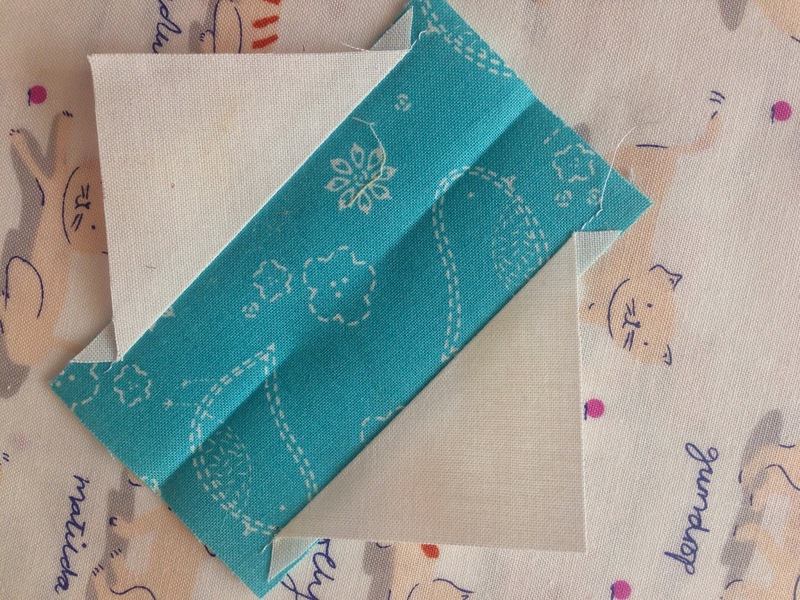 I just got my Aneela Hoey fabric today and I have 2 blocks made - can you send me your address please! Thanks so much for helping out! You're showing up as a no reply blogger so could you send me an email using the link at the top of the page or at annietwinkletoes@gmail.com Thanks! A lovely gesture. Wishing her and her family the very best. Hi, Chelsea -- where do I send the blocks? Thanks again for doing this. Is the quilt finished? Are you still looking for blocks? Have you heard how Aneela is doing? If you'd like to help out, that would be great! Blocks are still arriving daily and I hope to start assembling the quilt towards the end of the month. Thanks, Chelsea. I'm hoping to get some out to you in a day or two.